It’s one thing to stand at the crossroads of musical tradition and modern sound. It’s quite another to stand at this crossroads as the youngest member of the Marsalis dynasty, New Orleans’ famous “first family of jazz.” Percussionist Jason Marsalis hopes to prove the modern relevancy of traditional New Orleans music — whether in a standard jazz ensemble or with fusion sensation Snarky Puppy — and to this end, he brings his Vibes Quartet to SFJAZZ this week in promotion of his new record, The 21st Century Trad Band. Marsalis has played the drums from a young age, adding the vibraphone to his active repertoire in 2000. The large mallet instrument, resembling a xylophone or marimba but distinguished by a series of resonator tubes topped with motorized valves (which provide the eponymous vibrato), holds a distinguished if limited role in jazz, with luminaries ranging from Lionel Hampton to the Bay Area’s own Bobby Hutcherson. Like his outspoken and conservative older brother Wynton, Jason has sparked some controversy within the jazz community — in this case centering around a 2010 YouTube video in which Marsalis disparaged musicians whom he described as prioritizing certain technical ambitions over melody, history, and consideration for the audience. Yet this antagonistic rhetoric obscures a serious commitment to musical achievement, and looking past it reveals a genuinely appealing love of the art form that both sides of the tradition/modernism debate can agree on. We checked in with Marsalis ahead of his SFJAZZ residency, which runs Thursday, Dec. 4 through Sunday, Dec. 7. Your new record is called The 21st Century Trad Band — what does it mean to be a “trad” band in the 21st century, and how does that differ from a “trad” band in the 20th century? A trad band has to do with traditional jazz music that really is associated with New Orleans. Honestly, I have mixed feelings about it in this sense: It is true that the music started and was formulated in New Orleans, but unfortunately people see that music as a separate culture, and not the roots of all American music. For example, a lot of people don’t realize that if you take a musician like Louis Armstrong or Sidney Bechet or Jelly Roll Morton — that’s who all the musicians after came out of. But you have a lot of musicians who see that music as old and dated and not a music that anybody wants to listen to anymore. Or they see it as some separate thing that’s different from Charlie Parker, and it’s really not. So that’s why I have mixed feelings about it. It’s music that I love playing, and it’s a music that is definitely relevant in New Orleans, but it’s unfortunate that others don’t see the value in that music. I mentioned the 21st century because you’re starting to see updates to the traditional music. You have guys that still play these tunes; they play the same style but it sounds like 2014, it doesn’t sound like 1920. While that’s great, on the other hand, there haven’t been enough updates to the music. You hardly hear traditional elements used in more contemporary or abstract writing in jazz music, and you don’t hear traditional rhythms being used in other forms of music. That’s a thing that I’ve been trying to do, and I think there are other people starting to do the same thing.That’s the difference. In the 20th century it was a music definitely played within the style even when musicians brought in their own ideas, but for me the 21st century is about taking the traditional elements and bringing them into other settings. You’ve referred to jazz as “open architecture” — is this what you’re talking about? Yes, it is. It’s open in the sense that you can bring any music into this art form. Traditional music doesn’t have to stay in one style, it can be used in many other styles. What a lot of people don’t realize is that the rhythm of Motown music comes out of New Orleans music. If you think about the press rolls, or the roll of drums in Louis Armstrong’s music, and you re-orchestrate that in a different way you’re going to get a lot of the rhythms you hear in Motown or rock and roll. It’s really the same sort of rhythms, just re-orchestrated on different parts of the drums. What have musicians lost by not paying attention to the tradition? Most importantly: content, substance, and context. When you study the history of the music there’s so much you can gain from it. The more you learn, the more informed of a musician you’ll be, and the more context you’ll have inside of the music. You’ve grown up quite literally in the history of the music. What have you gained from that perspective, growing up as a Marsalis? I was fortunate to grow up around musicians who were serious about studying music, and they were serious about achieving the highest level of music that they could. I consider myself very lucky in that regard. What inspired you to take up the vibraphone more seriously? Well, it only had a handful of contributors, compared to other instruments, and I felt there was a lot that could still be done with the vibes. There were things that I could express melodically that were different from the drums. Who are you influenced by, as a vibraphonist? Lionel Hampton, for sure, and Milt Jackson. But also Bobby Hutcherson, and to another degree Gary Burton. Even some of the newer generation players, like Stefon Harris and Warren Wolf — there’s things I’ve learned from them. I’m pretty much interested in anybody who’s played the instrument. I’ve noticed more vibraphone players in the last 10 or 15 years, starting perhaps with the prominent use of vibraphone in Dave Holland’s band. Do you think there’s any kind of resurgence at all? It’s funny, Dave Holland uses Steve Nelson, but Nelson’s been around for a while. Nelson was in a lot of ways the go-to guy in the 90’s, but he was more of a sideman. He’s one whose music I’ve checked out. I remember his work with Mulgrew Miller, for example, very fondly. I think with Nelson in Dave Holland’s band, you may have had different guys paying attention to him that may have not, previously. But while there have always been people who play the instrument, I think there’s been a resurgence. Even in New Orleans, when I decided to play the vibes, within two years there were three more vibraphonists in the city. I think you’ll hear about more and more people playing the instrument. Have you played the new SFJAZZ Center before? I have not. I did a show once with Marcus Roberts for SFJAZZ (but not at the Center). This will definitely be my first show there as a leader. It’s great to play four nights in a row, because the music gets better and better the more you play, so I’m looking forward to doing this. This entry was posted in Articles, Press and tagged Bobby Hutcherson, Jason Marsalis, Jason Marsalis Vibes Quartet, Marsalis dynasty, Micah Dubreuil, open architecture, San Francisco, SF Weekly, SFJAZZ, SFJAZZ Center, The 21st Century Trad Band, vibraphone, vibraphonist on December 2, 2014 by abell. The Marsalis family is The First Family Of Jazz with father Ellis and sons Branford, Wynton, Delfeayo and Jason. Jason, the youngest brother, has been making great music for years as a jazz drummer. Recently, though, he broadened his percussion palette by mastering the vibraphone. We were pleased to host the newly-minted Jason Marsalis Vibes Quartet in the KPLU Performance Studio. The band played three original compositions. In between songs, Jason and KPLU’s Abe Beeson talked about Jason’s love for the vibes and the new projects the band is working on. This entry was posted in Articles, Press and tagged 18th Letter of Silence, Aaron Hushagen, Abe Beeson, KPLU, KPLU Performance Studio, live, live music, Seattle, studio session, The 21st Century Trad Band, The Man With Two Left Feet, vibraphone on November 13, 2014 by abell. Not just vibraphone, but glockenspiel, xylophone, marimba and even tubular bells. The youngest of the remarkable Marsalis brothers plays them all, sometimes multi-tracking several at once. This is an engaging set, tuneful and good-humoured, with titles like Blessed Unrest and The Man With Two Left Feet. Marsalis has a wonderfully crisp technique and a flair for inventing catchy melodies. As for the title number, you’ve never heard When the Saints Go Marching In sound anything like this. The rest of the quartet – pianist Austin Johnson, bassist Will Goble and drummer David Potter – really shine here. This entry was posted in Press, Reviews and tagged Austin Johnson, David Potter, glackenspiel, Jason Marsalis, marimba, The 21st Century Trad Band, The Guardian, tubular bells, vibraphone, Will Goble, xylopohone on November 8, 2014 by abell. A river of New Orleans jazz music runs deeply through the Marsalis family. From father Ellis through Branford, Wynton, Ellis Jr. and to the cousins beyond, music is the lifeblood that flows through their veins. Little surprise then that Jason, the youngest of the Marsalis family, carries on the proud tradition. Jason Marsalis and the Jason Marsalis Quartet bring their love of all things jazz to Dimitrious’ Jazz Alley Wednesday Nov. 5. One show only, the music begins at 7:30 p.m.
Jason Marsalis has been drumming all his life. In the last 15 years, he added the vibraphone to his repertoire. It is this fusion of percussive sound that he features in his newest album, 21st Century Trad Band. In a live appearance on KPLU’s Studio Sessions, Marsalis was asked about musical influence. “Well my family first, but I also was strongly impacted by the Afro-Cuban sounds of Abelardo Barroso, Bebo Valdez, and Armando Parazo,” said Marsalis. Marsalis’ group includes Austin Johnson (piano) Will Goble (bass) Dave Potter (drums) and Marsalis, concentrating on vibraphone but also taking a turn on the skins himself. Marsalis’ career was briefly derailed by Hurricane Katrina but has since taken on new life. His 2009 release “Music Update” was his first release as bandleader. The album was Jason’s celebratory response to his family winning the distinguished NEA Jazz Masters Award. Since that time, his career has only flourished. 2013 was a monumental year in which Marsalis released his next recording as a leader on vibes entitled “In a World of Mallets”. The album went to Number 1 on the CMJ Radio Charts and also won an Offbeat Magazine award, a New Orleans music magazine, for best Contemporary Jazz Album. Marsalis’ fans can expect to hear a wide-ranging eclectic set at Jazz Alley. From the titular track to the off-beat “For the Man With Two Left Feet” the Marsalis Quartet keeps the music humming. Featured are Jazz riffs and signature long pieces that show off the abilities owned by everyone in the group. The show is designed as an homage to jazz, blues, and the myriad music that has shaped Marsalis’ life. This entry was posted in Articles, Press and tagged Austin Johnson, axs.tv, CMJ Radio, Dave Potter, For the Man With Two Left Feet, In a World of Mallets, Jason Marsalis Quartet, Kim Hastings, KPLU's Studio Sessions, Music Update, NEA Jazz Masters, New Orleans jazz music, OffBeat Magazine, The 21st Century Trad Band, vibraphone, Will Goble on November 5, 2014 by abell. 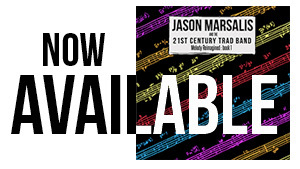 If you think the Marsalis family line ended with trumpeter Wynton and saxophonist Branford, you’re wrong because vibe play Jason Marsalis – the youngest sibling – has just released his second Vibes Quartet recording, The 21st Century Trad Band, on Basin Street Records. It’s the follow up to 2013’s In a World of Mallets, which made it to number 1 on the JazzWeek radio charts. This new effort continues the collaboration between Marsalis and his band, which includes Will Goble on bass, Austin Johnson on piano and David Potter at the drums. The album includes tracks like “Offbeat Personality,” which features a complex arrangement that mixes hard-swinging with melodic segments, as well as a few unexpected turn-arounds and a quiet intro. “The Man with Two Left Feet,” on the other hand, matches traditional jazz elements with a more contemporary feel. It shows what happens when a band is able to log many miles and years together prior to recording together. This album once again includes compositions from Marsalis’ band mates, but also features some works by fellow New Orleans musicians. For instance, Cliff Hines’s “Interzone” is included, as is Jason Weaver’s “Blues for Now.” Both men are graduates of the New Orleans Center for Creative Arts. Marsalis also gets a little social/political on one track, “BP Shakedown,” which is obviously inspired by the BP oil spill. A further sonic exploration is “Nights in Brooklyn,” which takes on film noire sounds. Although trumpeter Wynton is the most famous member of the family, his father, Ellis, is also a respected play. Brother Delfeayo Marasalis is a trombone player and producer. Wynton is a teacher and music educator, in addition to a composer and player. Anybody that’s ever seen him perform live has experienced his teaching skills — he loves to talk jazz history. He is also Artistic Director of the Jazz at Lincoln Center in New York City. Over the years, he’s won nine Grammys – in both jazz and classical music. In fact, one of his recordings was awarded a Pulitzer Prize, the first of its kind. Now, Jason is making a bold entry into this amazing family tradition. This entry was posted in Press, Reviews and tagged Austin Johnson, axs.tv, Basin Street Records, Blues for Now, BP Shakedown, Dan MacIntosh, David Potter, Discipline Meets the Offbeat One, glockenspiel, Grammys, In a World of Mallets, Interzone, Jason Marsalis Vibes Quartet, Jazz at Lincoln Center, JazzWeek, marimba, New Orleans Center for Creative Arts, Nights in Brooklyn, Offbeat Personality, Pulitzer Prize, The 21st Century Trad Band, The Man With Two Left Feet, tubular bells, vibraphone, Will Goble, xylophone on November 3, 2014 by abell. I have to thank Jason Marsalis for introducing my ears to the brilliance that is the vibraphone. A clear talent, Marsalis is a NOLA native and has long been experimenting with instruments, often collaborating with fellow musicians and groups until finally taking the lead as an album star. 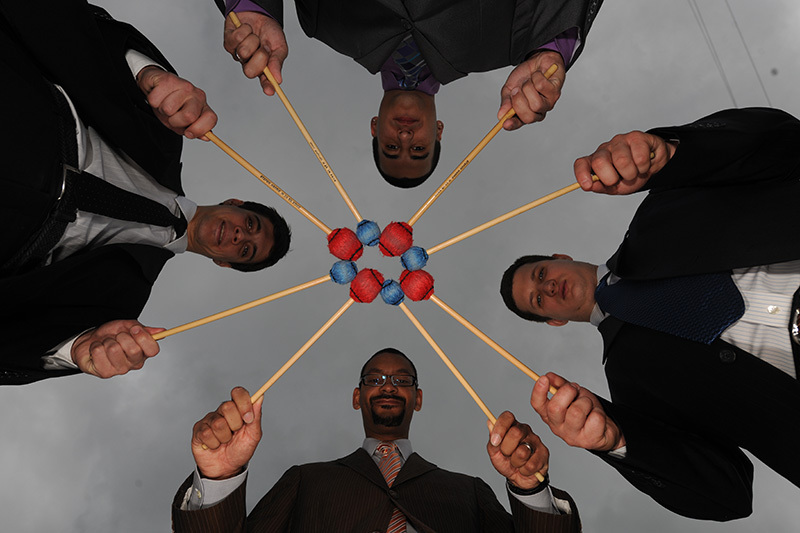 While each track on the album uses the some of the same instruments, Marsalis manages to create fresh beats for each song, giving the album a well-rounded feel and variety of music. However, if this album is one specific thing (other than good,) it’s most certainly jazz. With a vibraphone, piano, drums and bass featured on each track, the quartet offers plenty of smooth tunes for listeners to enjoy. Born and raised in a New Orleans jazz family, Jason Marsalis has contributed his musical talents to the jazz audience of Big Easy, creating a cult following that is always eager to hear new material. These tracks are relaxing and often ones you’ll find yourself snapping along to. While the vibraphone might be considered a bit of a risky attempt, Marsalis handles it with ease. 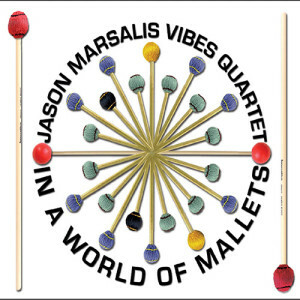 Whether you’re an old fan of the vibraphone or a new listener like myself, you’re likely to enjoy the chill sounds that is Jason Marsalis and the Vibes Quartet; a group producing jazz sounds that the Big Easy can be proud of. This entry was posted in Press, Reviews and tagged Jason Marsalis, Jason Marsalis and the VIbes Quartet, jazz family, Leith Tigges, NOLA, The 21st Century Trad Band, vibraphone, Where Y'At on September 22, 2014 by abell.